Mobile surpassed desktop searches last year, and both searches and purchases on mobile devices will only continue to grow rapidly. Recognizing this change in searcher behavior, Google had been making a concerted effort to educate and inform webmasters on optimizing for the mobile user experience. For example, recently we have seen Google release mobile-friendly labels in mobile search results, send mass notifications regarding mobile usability issues and offer new mobile usability reports in Google Webmaster Tools, and even released a new mobile friendly testing tool. Here’s an example of a message from Google Webmaster Tools alerting a site owner to mobile usability errors found on a website. While Google has already been known to reduce visibility for sites that offer a poor mobile experience, Google recently confirmed, that on April 21st, it will be expanding their use of mobile-friendliness as a ranking signal. Click-through rate (CTR) and search engine results page (SERP) bounce are two signals used by search engines as quality metrics. CTR helps determine the relevance of a site to a particular search query, and SERP bounce is used to evaluate the experience once a visitor arrives on your site. SERP bounce is also commonly referred to as “dwell time” in the SEO community. If visitors have a tendency to quickly leave your site, this tells search engines your site is either not very relevant to their search, offers low quality content, provides a poor user experience, or possibly a mixture of the three. To increase time on site, ensure your landing pages are intuitive, informative, and have clear calls-to-actions to reduce SERP bounce and improve time on site (as well as generate more leads and sales). With search quality metrics being weighted more heavily into Google’s ranking algorithm now, a focus on visitor experience can lead to higher rankings and more visibility in Google organic search. Regardless of the products, services or solutions your business offers, your customers are likely to have questions. Providing thought leadership through blog posts, tutorials, workshops, webinars and publishing content that resolves FAQs, can all work together to increase awareness, traffic, and keep visitors coming back for more. 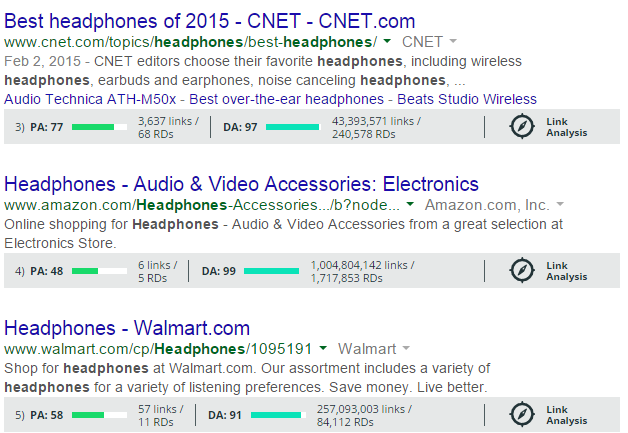 While Google uses over 200 signals in their ranking algorithm, it still relies heavily on backlinks and the link graph to help it evaluate the overall reputation and trust of websites. Consistently publishing engaging content is a sustainable way to earn natural links which can help to increase the overall visibility of your website in organic search results. Although some interesting research has been done on this subject, SEO experts still disagree on the direct impact that social media signals (+1s, likes, shares, etc) have on rankings right now. Many experts state that while social media signals have a strong correlation to high rankings, they are still not the actual causation, and while this may be true, being active on the same social channels as your target audience can act as viable assist or last interaction touch points. Working to establish a presence and build community on social networks can also translate to SERP visibility that can often include results from YouTube, Google+, Pinterest, SlideShare and other social networks. 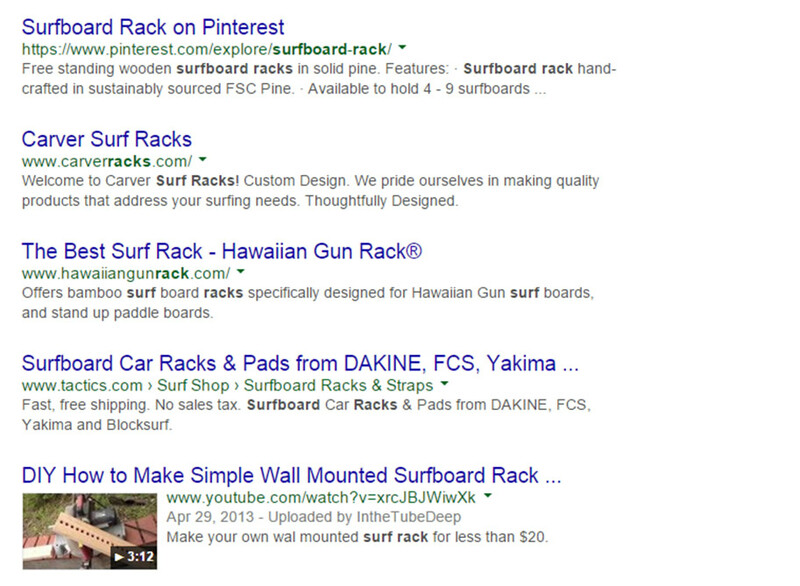 The below image shows a result for the query “surfboard rack” that includes both a Pinterest board and a YouTube video. With the recent deal that has Twitter giving Google access to their Firehose, expect to see event more social results, (especially tweets from authoritative users) appearing in Google SERPs. Schema is a way to markup the HTML on your website to help search engines return more informative and descriptive search results for users. There are hundreds of different markup types for practically any type of data on a site that ranges from places and events, to movie times and cooking recipes. 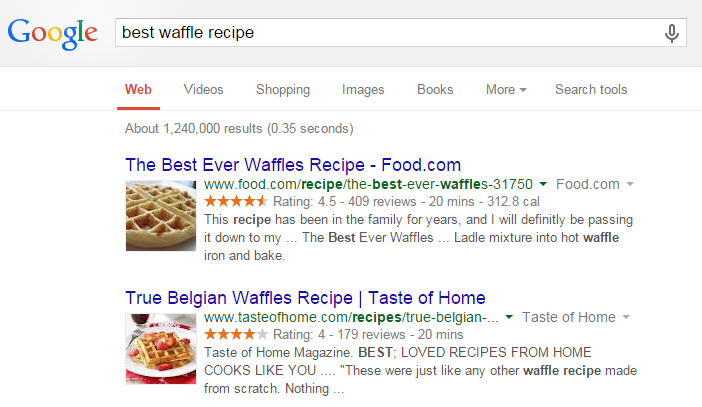 In the example below, these sites are using Schema markup to display ratings, number of reviews, total prep/cooking time, and even the number of calories for their waffle recipes. Schema resulting in rich snippets can not only help increase your click-through rate but also help search engines better understand and categorize your data. Adding the appropriate markup, should be an essential part of effectively optimizing your site for search. Despite the obvious benefits of using Schema, very few websites are fully embracing the use of proper Schema markup. According to a Searchmetrics study, only 0.3% of websites are using Google approved Schema. Structured data represents an opportunity for businesses to further help Google understand the content on their site’s pages. While Google still relies heavily on the link graph to evaluate the reputation and trust of a website, quantity of links will not trump quality when it comes to a website’s backlink portfolio. One of my favorite exercises with clients is enabling the MozBar in any given SERP to show clients that it’s not always the sites with the most backlinks that are ranking in top positions. Keeping a focus on acquiring inbound links from relevant, trusted websites that serve your target audience is sustainable and should be the foundation of any link acquisition strategy. While Google still uses anchor text to evaluate relevance, Google is getting much better at understanding the contextual meaning of a page and the relationships between people, places and things. While an overly aggressive EMAT link acquisition strategy can oftentimes result in quick wins, it’s a tactic that can put your website at risk for an algorithmic or manual action penalty. 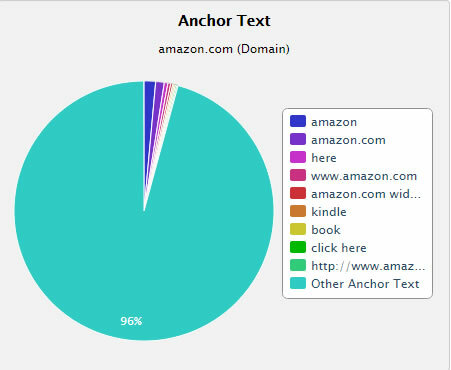 Link building expert Eric Ward once said that “the fastest way to create a suspicious looking inbound anchor text profile is to pay too much attention to it.” When you do have control of anchor text, optimize for the click, not the keyword. Having a firm understanding your target audience is one of the best investments you can make. As basic as this may sound, many businesses and brands haven’t fully invested in developing buyer personas and gaining a deeper understanding of their customers’ typical path to purchase. Having a grasp on the channels your customers use, pain points, questions, and interests, is vital for providing a great visitor experience and reaching potential customers and prospects with the right message at the right time. Brian Jensen is the Founder & CEO of Congruent Digital. You can connect with Brian below.